WHO'S IN CHARGE IN THE CONCOURSE ANYWAY? The Concourse Authority will meet next week to hear from consultants what a great job they have done and to vote to meet only 4 times a year. I've been told that the Concourse Authority is no longer the authority in the Concourse. Questions about anything but the roadways or the garage should be directed at the Rec and Park Dept. FIRST then, what's happening in the roadways? The Concourse Circulation Plan, Option 1A, don't work. This plan intended to restrict traffic in the Concourse to transit and pickup and drop off ONLY by the mounting of five verbose black and white signs up high. Then recall, the Authority sent out a bunch of threatening letters to the community warning of citations. 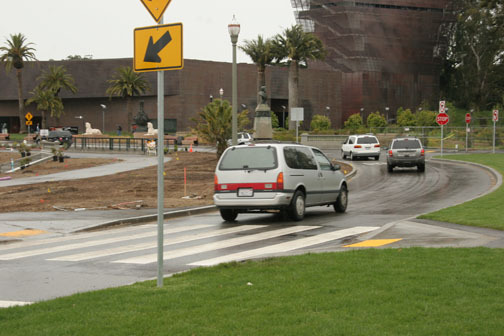 WELL, after two weeks of the Authority staff handing out 1,500 flyers, Park Patrol citing sixty-four drivers, $103 each, City Police, Park Patrol, and Authority staff randomly blocking off the roadways, traffic has actually increased, 90% of it in complete violation of posted restrictions DURING MUSEUM HOURS. A greater total just cruse thru the other 68% of the time. Traffic is typically at it highest evenings around 6pm. What, there is no parking in the Concourse now. OH? The area behind the Bandshell is SUPPOSED to be pedestrians only, but as Rec and Park has no enforcement in the area, who’s to challenge these cars. PRD haven't bothered to remove the old signs telling people to "PURCHASE TICKET AT MACHINE", much less put up NO PARKING signs. Though vehicle access to the area is bared, these drivers just use the pedestrian pathway to get in. Oh, though a big NO NO, cabs have taken to using the bike lane as a taxi stand rather than the provided pullouts. This forces bikes out into the path of other traffic and for skaters puts them on the textured roadway- NOT FUN. I pointed out to one driver that this could be a very expensive ticket and he replied, "%&#@ you." Using the bike lane is preferred by the valet services as well on the weekly evening events when the well heeled step from their cars to promenade in their finery. WHOSE I CHARGE OF PROTECTING THE LANDMARKED CONCOURSE? A little secret. NO ONE!! 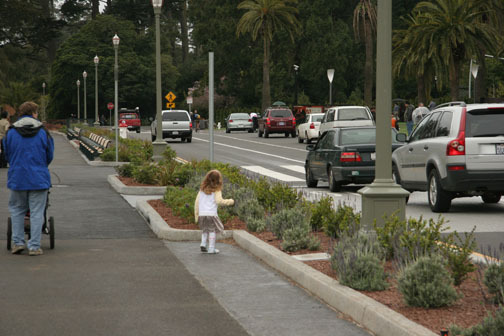 As noted, though Prop J, the Golden Gate Park Beautification Act, created the Concourse Authority to be responsible for the Concourse, they now refuse this responsibility. So is Rec and Park in charge? God help us if it is. Since reopened the Concourse stonework has become a destination for skateboards, this crew, filming their "grinding," were actually from Japan. Anything that can be ground down, is. Equally disturbing is the lack of respect shown by the contractors. The 1886 pedestrian tunnel under JFK was closed in March of 04. Shortly thereafter, the contractor ruptured a sewer line, filling the tunnel with wastewater, and almost filling the children's sandpit as well. Additional debris was added through the deYoung and Concourse construction process and when the Concourse was reopened in March of this year, the then Rec and Park Superintendent for this area insisted that the contractor clean up their mess before the tunnel could be safety reopened. WELL, Rec and Park has moved the Sup on and the contractor just unlocked the gates, now exposing children to this collected debris. I learned today 7/9 that the new PRD Superintendent has started sweeping the tunnel with a hand broom, but it a slow process without the power sweeper the contractor HAD on site for months. Also, someone should point out to him that he is sturing up some nasty stuff and without a respirator he is risking an equally nasty reaction. While I'm carping. The very heavy iron gates are a wonderful place for children to swing, BUT there is a very real probability that unless the gates are locked open, children will swing on them and smash a finger or hand. 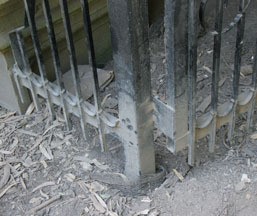 When they were installed I went through a long process of getting Rec and Park's attention of this hazard and getting an understanding that the gates should be locked either open or closed. As mentions repeatedly, Rec and park have no memory. Let Rec and Park hear it again: WHEN THESE GATES SERIOUSLY INJURE A CHILD YOU WILL BE RESPONSIBILITY. EACH ONE OF YOU READING THIS! And while we're on the topic of tunnels, the new southeast pedestrian tunnel is 6" low in the middle and though it does have a small drain which eventually allows the water that accumulates to filter out it leaves the crude behind. As of Saturday 7/8 this tunnel is littered with dirt and broken glass. The contractors for the Academy also tore up the new landscaping and pathway leading to this tunnel over a month ago and this destruction makes the pedestrian experience anything but pleasant. This is permanent. A work order has been issued to fix it, but considering the department masons did this in the first place, should we expect the repair to be any better? While I am carping on frustrations in the Concourse: Am I the only one that is getting really tired of the loudspeaker on the deYoung incessantly blaring a recording of a red tailed hawk in distress. 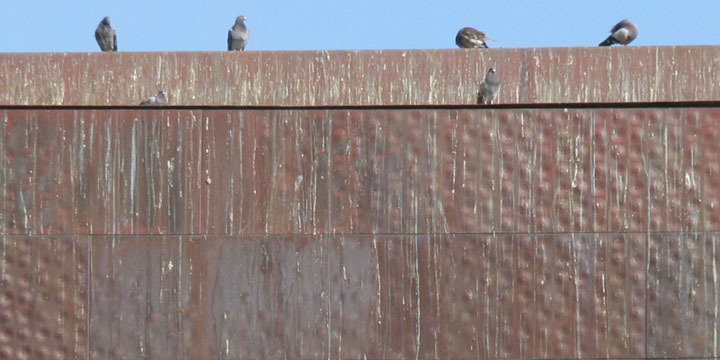 Obviously the pigeons that it is intended to discourage from craping on deYoung aren't bothered by it. Where are the good Audubons when one needs them. Whether the blaring recording scares off other birds is debatable. It does make it difficult to appreciate the natural bird sounds in the Park.